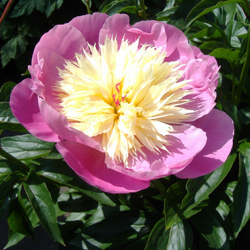 The Peony Group is a specialist group of the Hardy Plant Society formed in 1987, and exists to stimulate greater and more specialist interest in growing all types of peonies; bringing together amateur and professional enthusiasts worldwide. It also provides members with information about less well-known species, and aims to make peonies in general available to a wider audience. A newsletter is published twice a year, in Spring and in Autumn. This keeps us up to date with recent developments in the ‘peony world’ and encourages articles and inputs from all members of the group, regardless of experience or knowledge on peonies. Encouraged are articles about trips made to other countries looking at peonies; nurseries and gardens. Also included is practical advice on sowing, growing, and flowering peonies, as well as help with identification of peonies.There are now over 100 members of the peony group, both in Great Britain and overseas. Our international members can be found in the USA, Netherlands, Switzerland, Slovenia, Norway, Germany, France, Finland, Eire, Canada, Belgium and Australia. The Committee consists of a Chairman, Secretary, Treasurer, Membership Secretary, Newsletter Editor and Distributor. There are also strong links with other peony organisations. This year we met at the Hillside Centre, RHS Garden, Wisley. After the short AGM there was a talk by Caroline Stone on ‘I had a dream…how a passion for peonies began’. The afternoon programme included an introduction to and guided tours of the RHS Peony Trials, propagation demonstrations, and short talks. Specialist peony nurseries were present as well as our members’ table. There was no charge for the event. The 2017 Annual General Meeting of the HPS Peony Group took place on Sunday 14th May. Our AGM was followed by a lecture from Jeanine Lemmens from the Belgium Nursery Graefswinning. She and her partner specialise in peonies. The Peony - a Precious Landscape Plant' by Jeanine Lemmons. It will consider what makes a good plant for landscaping, not just the 'fluffy' aspect that many people fall for, but plant habits over the 3 growing seasons that make particular varieties particularly useful, with how they are bred and chosen etc. It will include tree peonies but will have a broader scope across the genus. She will try and bring a selection of flower heads in season. The Peony Group operates an annual seed exchange, whereby members donate surplus seeds, both species and cultivars; ‘tree’ and herbaceous. A nominal fee is charged for administration. Members often report back with interesting articles and photographs in the newsletter with news of their successes. Membership is open to all members of The Hardy Plant Society.